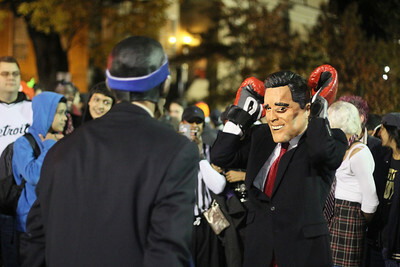 Dylan Moore dresses up as Barack Obama, and Chad Pierce dresses up as Mitt Romney. 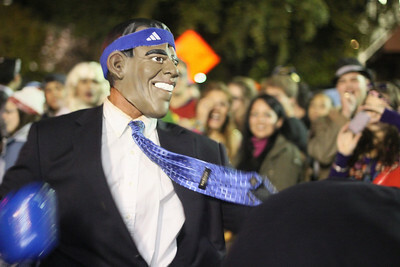 Dylan Moore dresses up as Barack Obama. 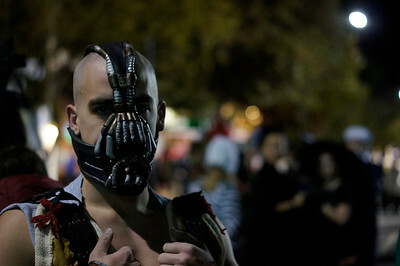 Christopher Batchedler, Sophmore, shows his home-designed Bane (from The Dark Knight Rises) character outfit. 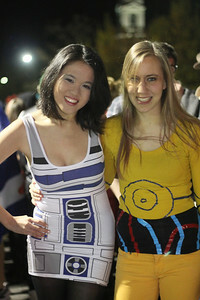 Jen Chai and Gabby Seider dress up as R2D2 and C3PO from the Star Wars franchise. 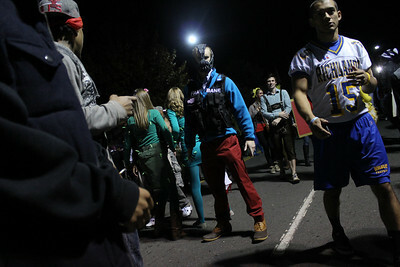 Matt Spear dressed up as Bane, the villain from "The Dark Knight Rises". 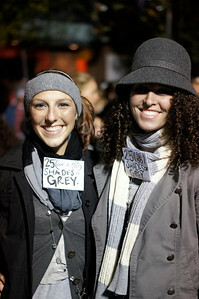 Freshman linguistics and Spanish major Brook Farmer and Freshman graphic design major Kristi Walker represent 50 Shades of Gray. 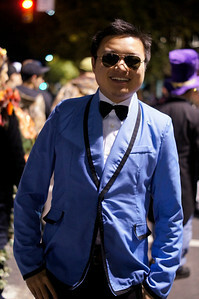 Taylor Peeng a Duke Masters student dressed up as Psy. 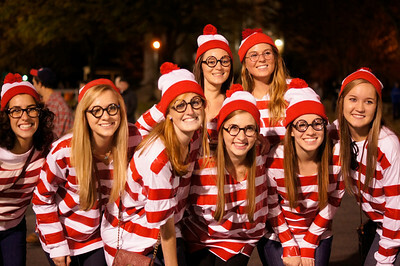 A group of Wendas pose for the cameras. 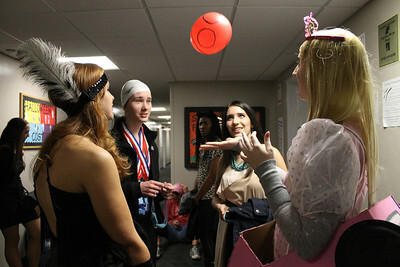 A&T Senior Christina Fenwick came to Franklin St. dressed up as a Na'vi from Avatar. 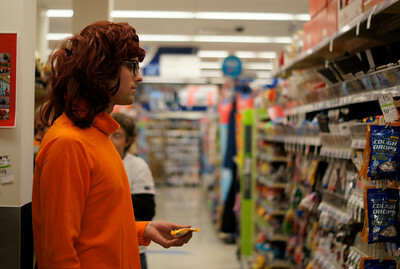 First-year UNC student Adam Oppenheimer dressed up as Velma from Scooby Doo debates what kind of candy he should buy. 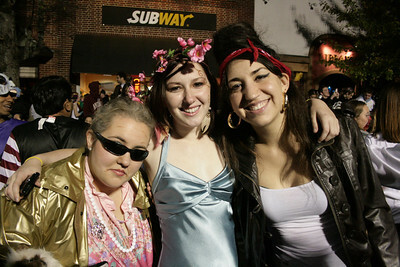 April Woerner, Emma Rich and Kate Leonard, UNC Students, dress up as Old Lady, Aphrodite and Amy Winehouse. 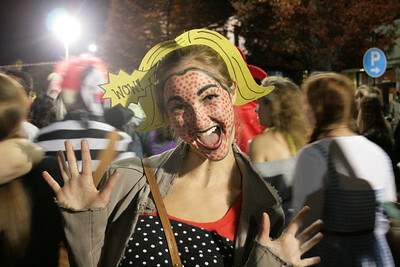 Jenna Schleien, UNC Student, dressed up as a girl from a comic. Southern Rail in Carrboro has opened a new coffee shop, "The Tiger Room" and Carrboro Pizza Oven is also opening soon. There's also going to be City Kitchen at University Mall. 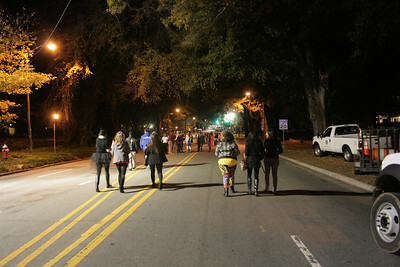 Fearrington Village celebrated its annual Pumpkin Fest on Tuesday night. 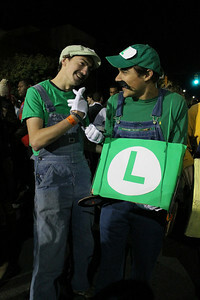 The village center was filled with jack-o-lanterns and stores were open late for Halloween festivities, including spooky stories for children at the bookstore. 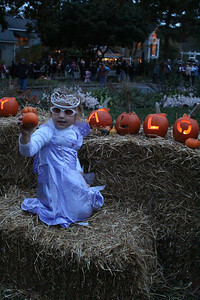 Alli Peterson, 3, of Cary, poses with some pumpkins in her princess costume. 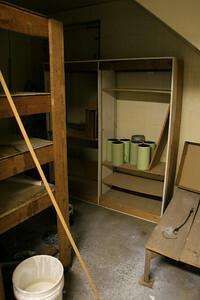 Underground Printing has had some spooky stuff happen in their basement, which used to be a coal factory where Ulysses, the UGP ghost, worked. 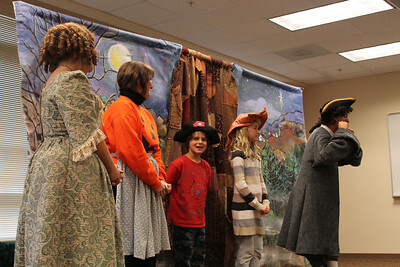 On Tuesday, October 30th, the Bright Star Theater company, from Asheville, NC, performed their rendition of the "Legend of Sleepy Hollow" at the Orange County Public Library in Hillsborough for an audience of young children and their parents. During the performance, the actors invited two children, Eli Aquino, 8 years old and a student at Cameron Park Elementary, and Hattie Bendall, 9 years old and a student at McDougle Elementary, to join them singing on stage. 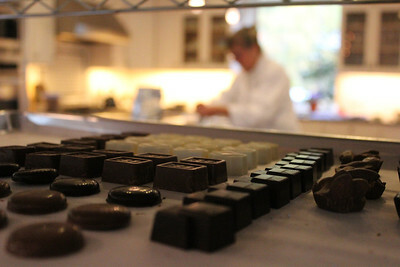 Mary Butler runs Carolina Confectionary out of her home on Nottingham Drive. 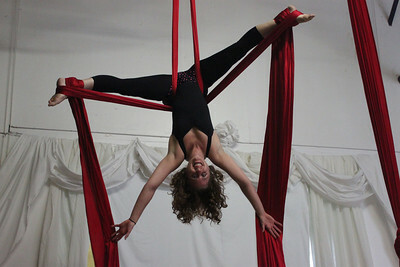 Jill Menard, an author and ariel dance in structure at the Flowjo studio in Carrboro, is currently ranked 5th of 244 in an online nationwide competition for short stories. Her story, "The Odd Duck," is about an awkward kid who struggles to fit in. 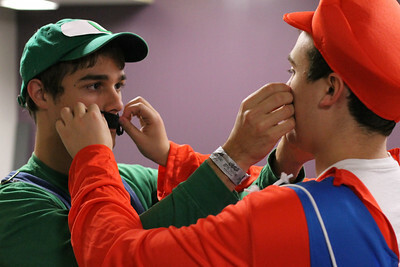 "I think a lot of basis of the story is that as a kid, I was very awkward," said Menard. 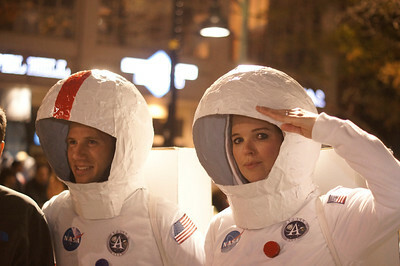 "Some of the inspiration now is that as an adult, you realize you can achieve anything." 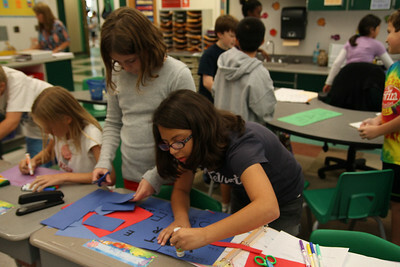 Keelin Caffrey and Soleil Garcia-Johnson work on Soleil's class-president campaign posters. 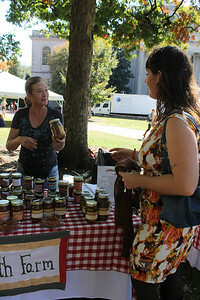 Staff member Shana Garr buys preserves from Rose Shepherd of Blessed Earth Farm at the Farmers Market in Polk Place run by Carolina Dining Services. 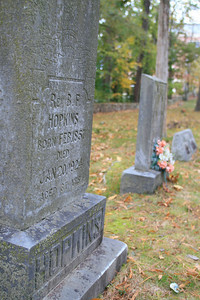 Rose has been making preserves for thirty years, and has been selling them from her home for ten. 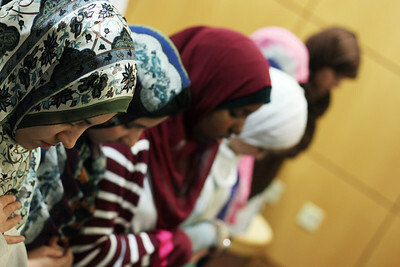 The MSA Fast-A-ThonThe Muslim Students Organization hosted their largest fundraiser, the annual Fast-A-Thon, on Wednesday night at 5:30 in the Great Hall of the Student Union. 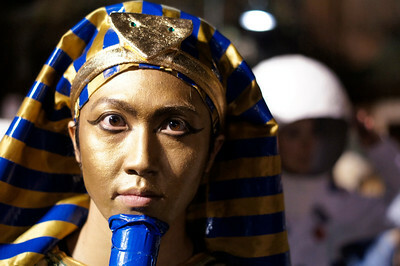 The event began with a dinner for the participants, who had fasted all day. 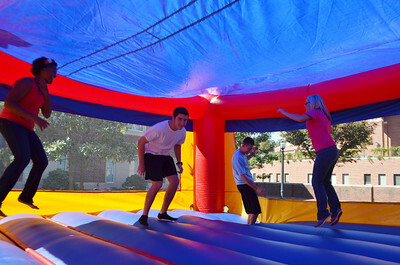 Proceeds from the ticket sales go to the Syrian Humanitarian Relief Fund. 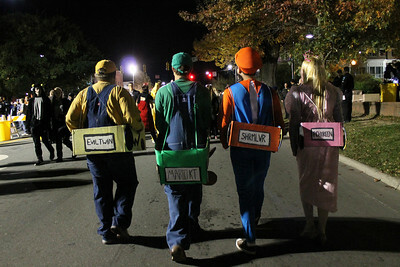 The cast of LAB! 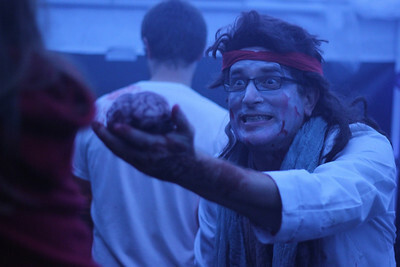 Theater's Jon runs through a dress rehearsal on Tuesday night. 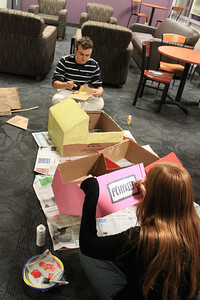 The play, written by George Saunders directed by Jordan Imbrey will be performed in the CDA October 25-27. 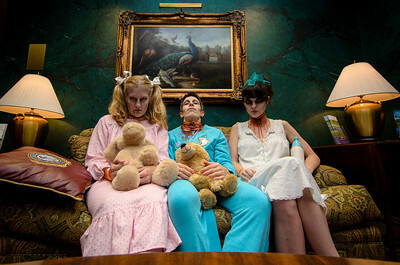 From left to right: James Flowers, Charlie Monroe, Kayla Gibson, Drew Patrick, Amy Whitesell, Noelle Wilson The cast sits facing the audience looking up at an imaginary screen and laughing during one of the scenes. 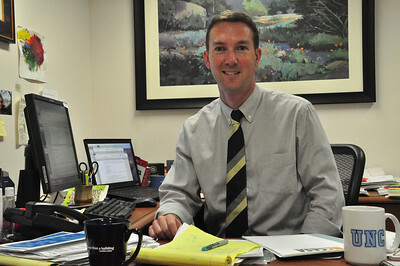 Bob Pleasants is the Interpersonal Violence Prevention Director. 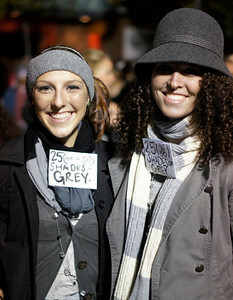 This month is Sexual Assault Awareness Month. 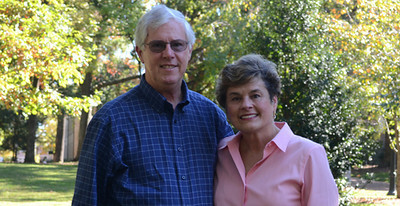 Eric and Rita Bigham's donation helped recover artifacts from Blackbeard's sunken ship. 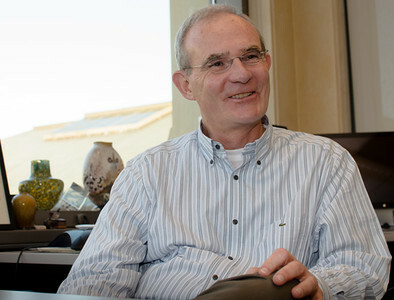 Terry R. Magnuson, Ph.D., Sarah Graham Kenan Professor and chair, department of genetics, and vice dean for research, School of Medicine, University of North Carolina, Chapel Hill, was elected to the Institute of Medicine in October. 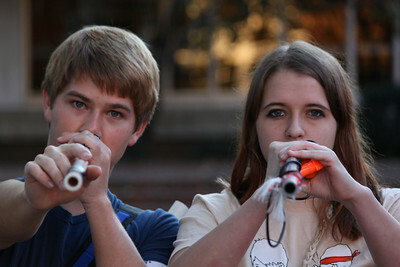 Sophomore Tanner Fadero and graduate Laura Stubbs demonstrate the use of their blow guns that they will use during Humans vs. Zombies. 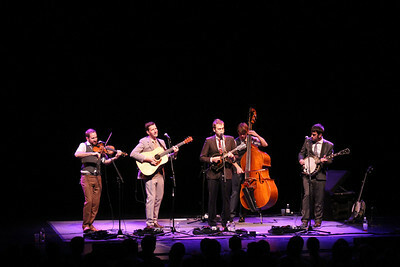 The Punch Brothers played Memorial Hall on Tuesday night. Tom Brousseau opened for the band. 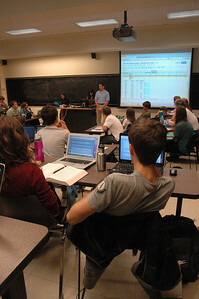 94th Student Congress meets to decide the fate of a bill that would effectively disenfranchise the Tar Heel Rifle and Pistol Club. The President of the Tar Heel Rifle and Pistol Club stands to listen to the members of Congress. 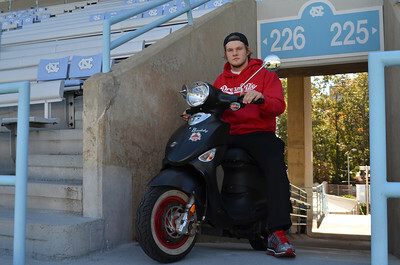 Zach Ferguson, 2nd year Law student leans back and listens. 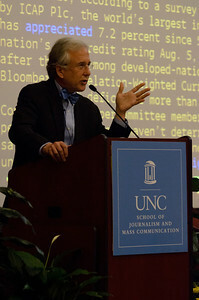 Matthew Winkler, Editor-in-Chief of Bloomberg News, addresses students and guests on the campus of The University of North Carolina at Chapel Hill on October 16th, 2012 in the George Watts Hill Alumni Center. 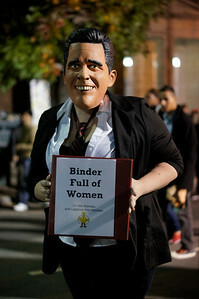 Mr. Winkler's lecture was titled, "2012: The Economy Election". 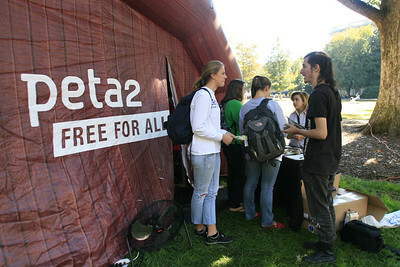 Michael "Radish" Mullins (black shirt) and Yennifer Martinez (striped shirt), who work for PETA, talk to Sophie Dockstader (left), Chelsea Krivanek (middle), and Cari Blalock (right). 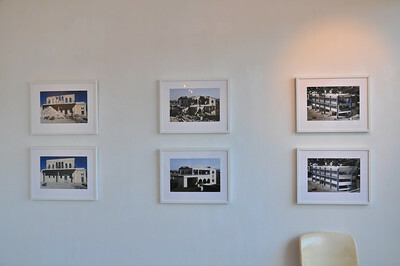 Starting October 17th this artwork made from cutting up and pasting old photos of bombed buildings, military bases, and villages attacked by drones will be hung up and featured in the John and June Allcott Gallery.